New research shows that astronauts who return from extended missions in space experience a significant weakening of their spinal muscles. Disturbingly, their back muscles don’t return to normal even after several weeks back on Earth. Muscles supporting the spine weaken after prolonged exposure to microgravity environments such as the International Space Station, claims a new study published in the science journal Spine. It’s yet another condition that can be added to the ever-growing list of space-related health problems experienced by astronauts. Back pain is not uncommon during prolonged space missions, with around half of all astronauts affected. Returning crew members are also at increased risk of spinal disc herniation after prolonged exposure to microgravity, with cases appearing at a rate four times higher than normal. These back issues may have something to do with the roughly two-inch increase in body height that follows an extended mission. This dramatic height increase is likely the result of spinal unloading, when there’s suddenly no weight imposed on the lower back. To learn more about the effects of microgravity on spinal health, Douglas Chang and colleagues from UC San Diego Health analyzed six NASA astronauts both before and after spending four to seven months in the International Space Station (ISS). Each crew member had MRI scans done on his or her spine prior to the mission, and scans done both immediately and two months after returning to Earth. The MRI scans showed a significant weakening, or atrophying, of the astronauts’ paraspinal lean muscle mass. These small muscles connect to the vertebrae and direct the motion of individual bones, helping to support and prevent misalignment of the spine, while allowing for core movement. Scans showed that the functional areas of the paraspinal muscles decreased by an average of 19 percent over the course of the mission. Two months later, the astronauts had only recovered two-thirds of the muscle loss. The situation was just as bad for the functional areas of the paraspinal muscles relative to total paraspinal area. Here, the ratio of lean muscle decreased from 86 percent preflight to 72 percent immediately post-flight. Months later, the ratio recovered by 81 percent, but was still less than the preflight levels. 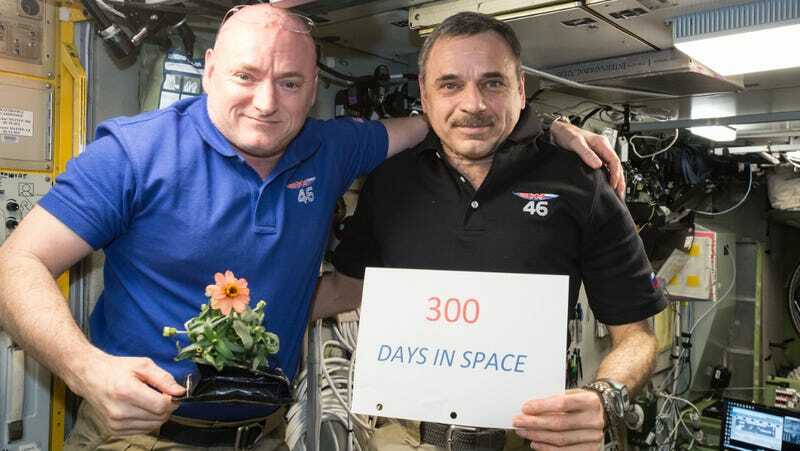 This means that long-flight astronauts will likely have to rethink their workout regimens both before and during spaceflight. The authors of the new study suggest yoga and core-strengthening exercises, including those recommended to patients with back pain on Earth. As this study shows, space is exceptionally tough on humans. Previous work shows that long-term exposure to microgravity causes dramatic losses in bone density and muscle mass. It also causes a release of calcium, which increases risk of kidney stones, bone fractures, and further reductions in bone mass. Microgravity also causes the heart to weaken over time, leading to deconditioning and even shrinkage. Extended weightlessness has even been linked to vision impairment and problems with genetic expression. It’s becoming increasingly clear that if we’re to live and work in space, we’ll have to give ourselves a major upgrade.